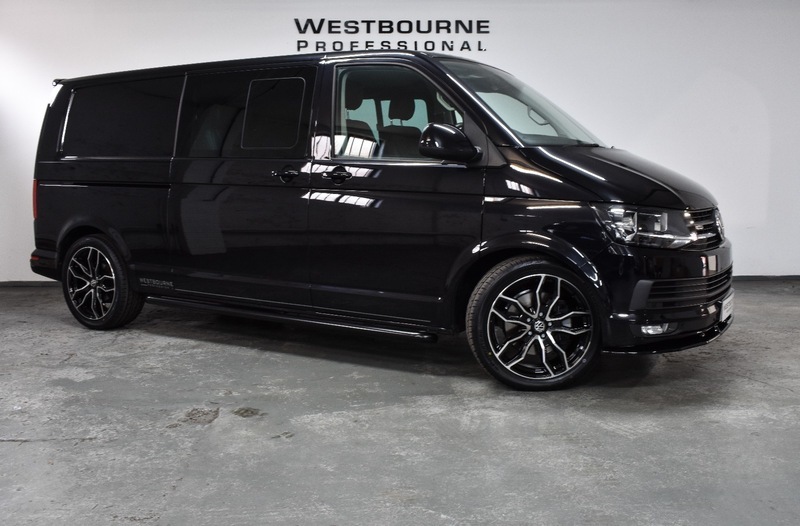 We are delighted to offer for sale our latest 2018 model Westbourne Edition Transporter, boasting one of highest level specifications of any VW Transporter currently on the market. A LWB factory Kombi finished in stunning Deep Black Pearl, with the 204ps engine coupled to the 7 speed DSG automatic gearbox with 4motion all wheel drive system. Factory specification on this particular van includes Discover Media Sat Nav System, Cruise Control, Bluetooth, DAB Radio, Power Folding Mirrors, Comfort Dashboard with Carpet Flooring, Front & Rear Parking Sensors with Reverse Camera, 2+1 Split Rear Seats, Twin Sliding Doors, Power Latching Sliding Doors & Tailgate, Heated Front Seats, Leather Multifunction Steering Wheel, Front Assist with City Emergency Braking, Electric Windows, Glazed Tailgate, Air Conditioning. The vehicle was ordered new by ourselves and upgraded to the Westbourne Edition pack and has since been used by our sales manager as his personal vehicle. The Westbourne Edition conversion includes Premium Leather Upholstery, Two Tone Rear Carpeting and Alcantara / Suede Panels & Headlining, 20' Polished and Black Audi RS Style Load Rated Alloy Wheels with Load Rated Tyres, 40mm Lowered Suspension, Gloss Black Front Splitter, Colour Matched Sportline Rear Tailgate Spoiler, Satin Black Side Bars. We are also able to add upgrades such as LED Lights, Tow Ball and much more. This vehicle is sold with balance of VW Warranty to July 2021. Westbourne Professional are proud to be an AA Approved dealer with full dealer facilities on offer with us include part exchange, finance (subject to status), UK and European delivery, tow bar fitting and much more. Our 5,000 sqft indoor showroom is located in a historic army barracks close to the Sheffield city centre and just minutes from the M1 and Sheffield Train Station. In order to offer the personal service we pride ourselves in, all viewings are by appointment only.